With ice fishing season steadily drawing nearer, many anglers are already growing anxious to fill their freezers with panfish fillets. Any seasoned ice angler will have his or her own proven bluegill dishes, with most leaning towards a traditional pan-fried entrée. You'll hear no complaints from anyone regarding fried bluegill fillets, but anyone interested in experimenting with a few different recipes, I've picked a few easy, but creative, options that I've made in the past that will add a little excitement and zest to your kitchen this season. 1. Combine lemon pepper, salt, garlic and onion powders, lime juice, and fish strips in a plastic freezer bag and shake. Chill for 30 minutes. 3. 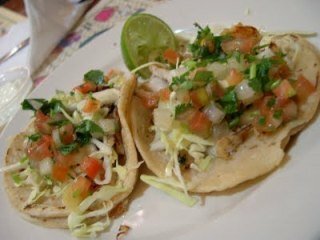 Fill tortillas with fish and garnish with any of the following: chopped cilantro, salsa, avocado slices or guacamole, red onion, tomato slices, minced jalapeno–whatever you want! This is a delicious and healthy dish that is sure to earn a permanent spot in your recipe book. 1. Heat up a wok or skillet and add canola oil. 3. Fish is done when it flakes easily, then spoon mixture on top of rice. There are, of course, hundreds of other amazing recipes to choose from when cooking your ice fishing haul and with such a large daily limit on panfish out on the ice, lucky anglers will have ample opportunity to try them out. The recipes above are simple, healthy, and tasty meals that have worked out great for me and I know they'll do the same for you. Feel free to modify the ingredients to your liking and be prepared to add a few more chairs to your dining room, because once your guests try these dishes, I can assure you they'll be over for many meals! next articleAlligator Gar: Nuisance or Living Fossil?